“Paying attention is the cheapest price to pay folks,” Chuck D said. Working collectively, knowledge, and the support of local artists were at the center of Chuck D’s message as he spoke to a crowd gathered at Augsburg’s MLK Convocation. Truth Maze gets a hug from Chuck D.
Attendees at the Augsburg MLK event, Jan 18. Reis Francisco Romero who attends Augsburg introduces Chuck D . Reis was instrumental in getting Chuck to come to speak and is a member if Zulu Nation. 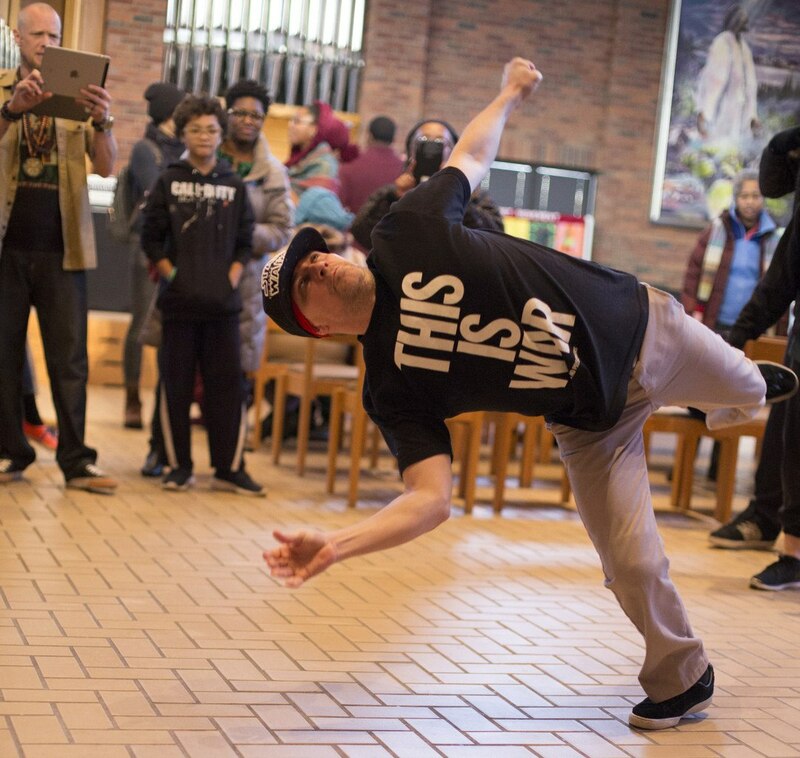 Working collectively, knowledge, and the support of local artists were at the center of Chuck D’s message as he spoke to a crowd gathered at Augsburg’s MLK Convocation: Race, Rap & Reality on MLK Jr. Day, Monday, January 18. 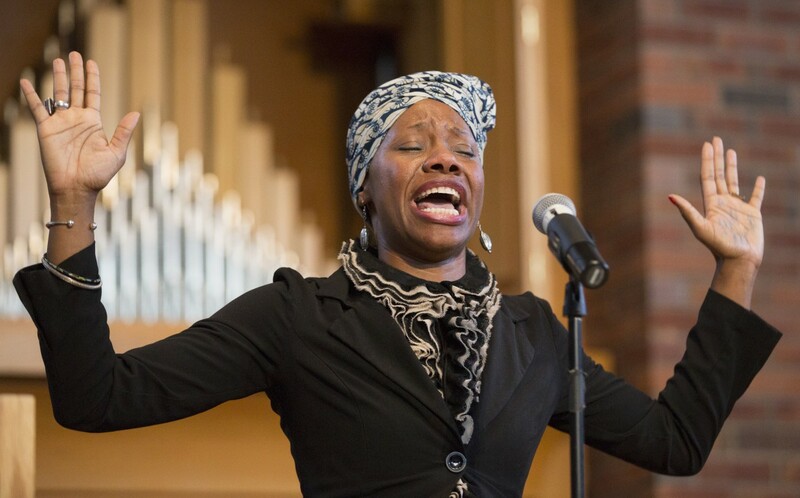 Hosted by Augsburg’s chapter of Save the Kids, “a fully-volunteer national grass-roots organization dedicated to alternatives to and the end of incarceration of all youth and the school to prison pipeline,” according to their website, the event also featured performances by Madiba, American Idol contestant Dahlia Jones, Truth Maze, and Malick Ceesay. While those in attendance showed up to hear Chuck D’s words of wisdom, the Public Enemy legend made it very clear that he was in attendance to see the local acts before him. His excitement was noticeable as he jumped to his feet and snapped photos of the acts smiling from ear to ear. Sha Cage a delivered heartfelt performance. It seemed that the hip hop pioneer had a special appreciation for Madiba’s artistic delivery and unique sound. Comprised of E.G. Bailey, and Sha Cage, and featuring Truth Maze, Madiba delivered heartfelt expressions on the topics at the heart of the current movement taking place in the city — police brutality in connection with mortality of young Black boys in our community. Aside from the performances, and Chuck D’s reception of each of them, the keynote speaker had so much more he wanted to share with the audience, like the importance of traveling the world, understanding geography, and the importance of supporting local artists. Robert Harper, Augsburg senior and football teammate of Saye, added that he didn’t understand why we have so many boundaries. “Like when [Chuck D] talked about being Black and then being African or African American — not separating yourself from people that have the same heritage as you,” said Harper. Other concepts Harper, Saye, and others that MSR was able to catch up with caught onto is the importance of working together as a collective, respecting and understanding that the “old heads” are still very useful and have a role in the movement for equal rights, and the chronic need of everyone knowing what’s going on around them. “Paying attention is the cheapest price to pay folks,” Chuck D said. Ironically, during the MLK Convocation, King was acknowledged, but he was not heavily focused on. Instead, every speaker chose to speak on how the tragedies of today relate to the injustices 30 years ago during the hip hop movement, and over 60 years ago during the Civil Rights Movement. MSR spoke with the president of the Augsburg chapter of Save the Children, Reis Francisco Romero, who will be graduating from Augsburg this this spring with a bachelor’s degree in social work. Romero said he was determined to bring Chuck D or any other socially conscious rapper like Ice Cube or Rakim. Attendees enjoyed noted speakers, music and dancing. Others shared Ramero’s sentiments, and Chuck D’s words of starting close to home and local. How local? Well, Harper and Saye are starting as local as Augsburg College, and as small as the athletic department. The two say they are in the process of starting a new student organization for athletes — specifically athletes of color — that will allow them to openly speak about injustices. Harper points out that while the college is known for its diversity, he’d like to see a more diverse faculty and coaching staff, stating that he recently attended a NCAA conference and saw mostly White men. Although Martin Luther King, Jr. Day is a great day of reflection, as is Black History Month, it was refreshing to attend a public event that focused little on the past work, and more on the work still needed to be done in order to continue the pursuit of achieving the dream.